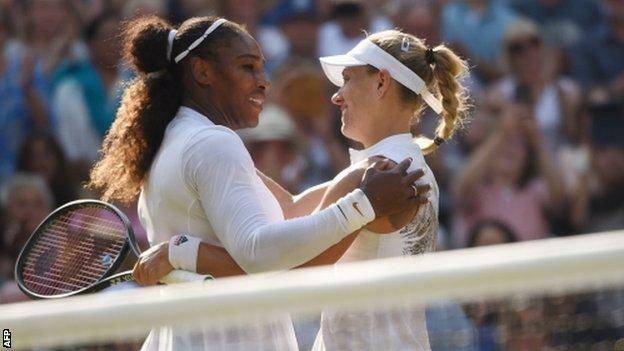 Angelique Kerber beat seven-time champion Serena Williams to win her first Wimbledon title and spoil the American’s dream comeback as a mum. The German 11th seed, 30, beat the 23-time Grand Slam champion 6-3 6-3 to add this title to her 2016 Australian Open and US Open crowns. Williams had been the favourite despite it being only her fourth tournament since giving birth in September. Kerber dropped to the grass when a netted service return gave her victory. “It is a dream come true,” said Kerber, who is the first German woman to win the title since Steffi Graf in 1996. Williams said she had been happy to simply get to the final so soon into her comeback, adding: “It is obviously a disappointment but I can’t be disappointed. I’m literally getting started. Kerber, known for her defensive style, came to the match with a more attacking plan in mind – keep the point going and exploit Williams’ lack of mobility around the court. And it paid off handsomely with the 36-year-old’s dashes to the net ending in errors half of the 24 times she came forward. Kerber stuck with her tactics in the second set, breaking in the sixth, and the sight of Williams falling to the ground in frustration when she missed a straightforward lob for 30-0 when Kerber was serving for the match summed up her day. 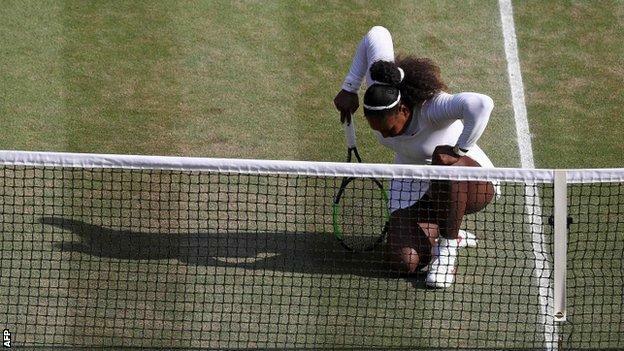 Overcome by the magnitude of what she had achieved against a player who beat her in the 2016 Wimbledon final, Kerber collapsed on to the ground and covered her eyes, while Williams came over to her side of the net to share a warm embrace. Williams, like Kerber, had dropped just one set on her way to the final but she had also faced only one player ranked in the top 50 here before Saturday’s showpiece. Despite her world ranking of 181 and special seeding of 25, she has been favourite for the title, with pundits and players pointing to the potent combination of her intimidating aura – created by titles, fitness and mental strength – and the fact that her power game is perfectly suited to the fast surface of grass. Williams, in fact, hit more than twice as many winners as the German (23-11) but was let down by some rash forehands and below-par net play in front of a packed Centre Court, where her friend the Duchess of Sussex was watching from the Royal Box. It means her bid for a record-equalling 24th Grand Slam title must wait until next month’s US Open at least. Billie Jean King, six-time Wimbledon champion on BBC TV: “After that very first game, you could see Kerber thinking ‘woah, this is great, good start’. You could see it in her body language, she really settled in. Martina Navratilova, nine-time Wimbledon singles champion on BBC TV: “More balls came back, Kerber returned Serena’s serve well. Serena didn’t get the payoff from her ground strokes, tried to hit harder and made more errors. “She came to the net more often which she doesn’t do a lot.